Alsace is located in north-eastern France, alongside Switzerland and Germany. Its modest surface area (8 280 km²) makes it easy to discover, while at the same time offering a wide variety of landscapes ranging from forests and valleys to plains and peaks. 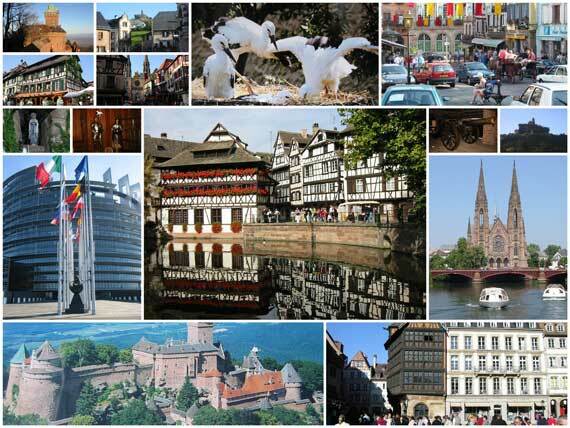 Alsace is one of the most dynamic and prosperous regions in France. With its border location, Alsace is situated at Europe’s economic crossroads around the Rhine. The region boasts an impressive modern infrastructure enabling it to fulfill its role as a trading centre between northern and southern Europe. Alsace is furthermore famous for its vineyards (especially along the 170 km of the Route des Vins d’Alsace from Marlenheim to Thann) and the Vosges mountains with their thick and green forests and picturesque lakes. Alsace possesses a huge variety of resources and attractions guaranteed to please even the most varied and demanding of visitors.